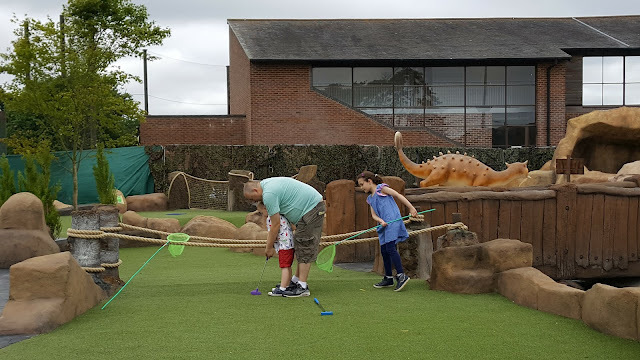 Last weekend saw the grand opening of Mighty Claws Adventure Golf in Bournemouth and we were lucky enough to be one of the first families to try it out. 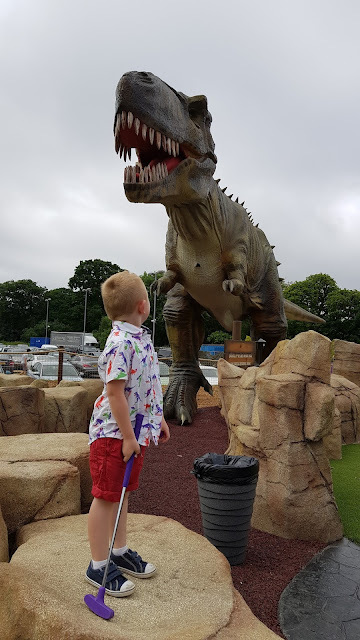 Elliot loves crazy golf and he's also dinosaur obsessed so it was a match made in heaven really - from the minute we pulled into the car park and he spotted the volcano, he was a bouncing excitable ball of energy! 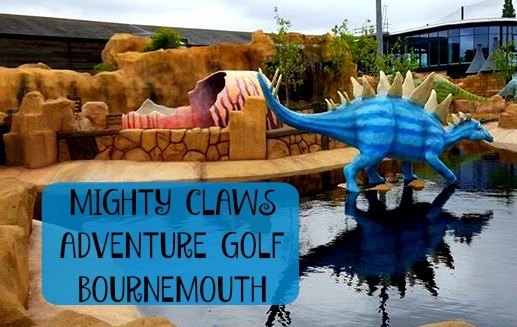 Mighty Claws Adventure Golf is the brainchild of Allan Saud who owns the Playgolf course in Bournemouth. 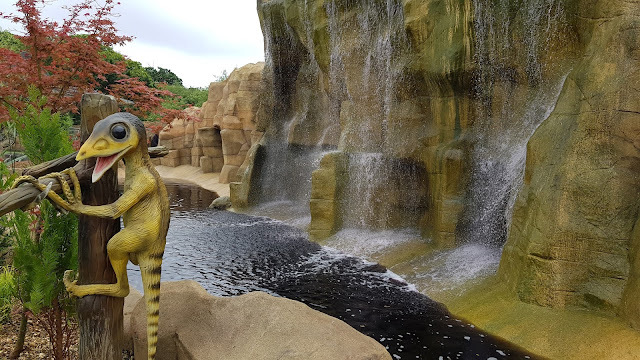 The 18-hole adventure golf course features large scale animatronic dinosaurs, an erupting volcano and a 5 metre high waterfall....if you look closely you might even notice that the water is an unusual colour! Is it water?! Is it Ribena?! 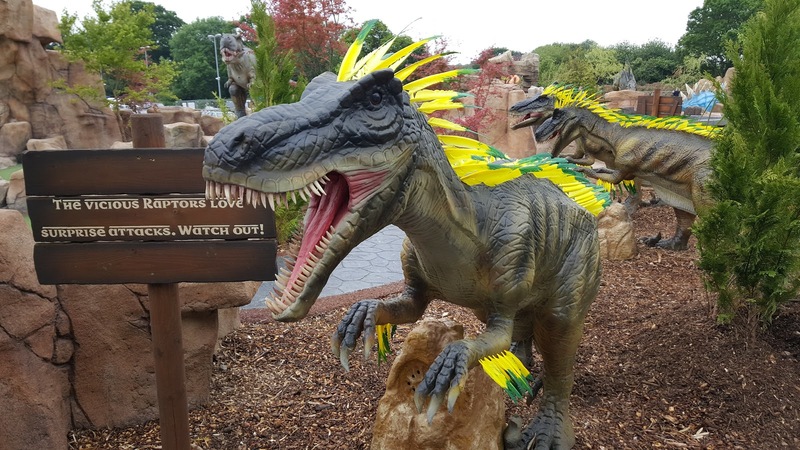 The course is based around the "Invasion of the Iron Jaws" story which features a whole host of lovable dinosaur characters who have to undertake a series of fearsome adventures in order to free their valley from the evil Iron Jaws. We couldn't wait to get started! 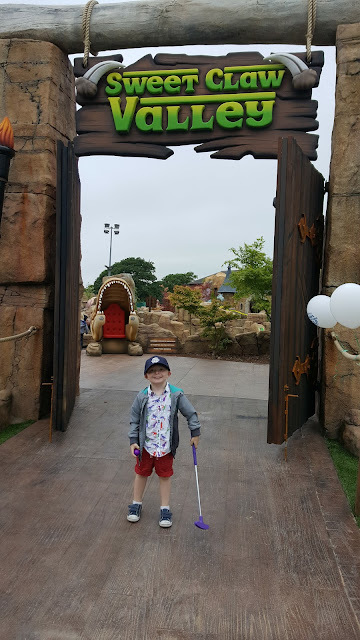 We picked up our clubs and balls from the front desk and made our way to the entrance and through the impressive double doors and under the Sweet Claw Valley archway. 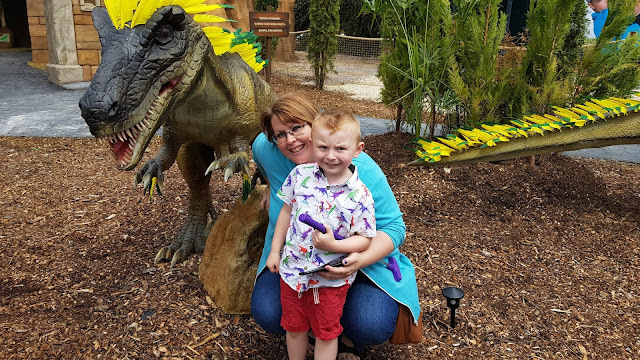 We actually bumped into some friends (Emma who writes at Families Online) so we did the course with them which made it even more fun! The 18 hole course is suitable from 4 year and up and obviously the holes vary in trickiness. 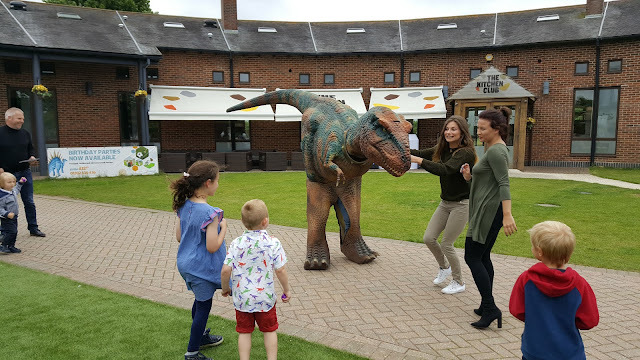 To be honest, I think the kids cheated but everyone was having so much fun that it didn't really matter! The favourite amongst the children was the hole that involved hitting the ball over a stream...needless to say the balls dropped in but luckily nets are supplied to fish the balls out!! As we finished the course we spotted Toby the T-Rex so we nipped over to say hello - he was quite an enthusiastic dancer!! 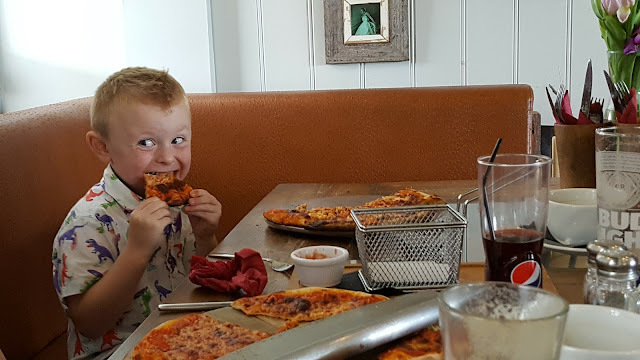 We headed over to The Kitchen Club for some well earned lunch where it was pizzas all round. Elliot didn't want pizza originally but even he couldn't resist a slice when he saw how good they looked. We had a fab morning at Mighty Claws and would definitely recommend it as a family friendly activity. Kids are well catered for with smaller clubs and the course itself is well laid out and completely accessible for buggies and wheelchairs. 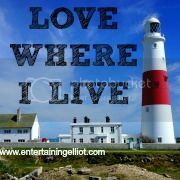 There are advantages to both and knowing every one of the actualities about the advantages and disadvantages will enable you to settle on an informed choice. Gas and electric utilized golf trucks appear to be identical, generally.